Remember Battlezone? It was one of the first real 3-D video games that Atari released to arcades in 1980. You drove around on a vector grid in a transparent 3-D tank, blasting other transparent 3-D tanks, jeeps and the occasional UFO into small geometric pieces, while avoiding geometric obstacles. Battlezone was all about the vectors. And, believe me, it was pretty revolutionary in its day. Truth is, I don’t remember Battlezone well, but I do remember its progeny. I got my tank-killing kicks in college playing Spectre VR on my Mac SE. I had a knack for blowing away my enemies while speeding away from their deadly fire in reverse. Tanks for the Memories: Vector Tanks recreates the thrill of old school tank battles you may remember from such games as Battlezone and Spectre VR. Vector Tanks by Peter Hirschberg and Chillingo is essentially Battlezone for the iPhone and iPod touch. The first-person, 3-D tank shooter looks and sounds like the Atari classic but functions like an iPhone game. If anyone still doubts the iPhone’s future as a gaming platform, Vector Tanks offers a healthy dose of retro reality. Almost everything about Vector Tanks looks and plays like an old cabinet arcade game. When you launch the app, you see an arcade-style attraction screen that cycles through animation of the game and the game’s scoring system and power-ups. As with the original, there are several power-ups, including shields, rapid-fire and an awesome nuke. One hit, and you’re dead. Look out for land mines. Oh, and you only get three tanks in three modes of play—novice, medium, and expert. Just like the old days. The game’s controls take some getting used to. An online user manual, which the game will open in Safari, provides an excellent rundown of the game mechanics. Let’s face it: Touching a small screen is a strange substitute for a joystick and a fire button (or arrow keys and a spacebar for that matter). You might find yourself bewildered and frustrated at first, driving around in circles and getting blown up a lot. Well, that was my experience anyway. Players with greater thumb coordination will probably have no trouble adapting. 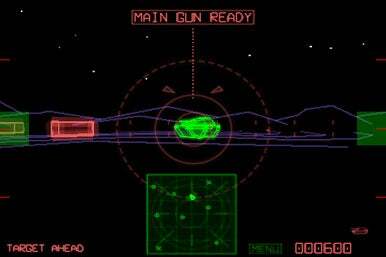 But I still find myself wishing there was a way to fire the main gun without stopping or removing my thumb from the screen. It took several games before I really got the knack of tapping left to turn right and pressing both thumbs at the top of the screen to barrel straight ahead. Of course, the more you play, the better you get. The game rewards long shots with score multipliers. And smaller, swifter jeeps are worth more than lumbering tanks. It wasn’t long before I was blasting jeeps in reverse will dodging enemy tank shells. A minor drawback of the game is the resolution. With its classic black background and green, purple and white 3-D models, the game is very dark, and the contrast is quite low. You can adjust the brightness somewhat, but I still found the game difficult to view in low light. Finally, if you happen to let your phone or iPod go to sleep between games, the touchscreen controls will seize up and you will need to relaunch the app. It’s a minor glitch that I hope the developer can remedy in future updates. Chillingo offers a free version where the limit appears to be that you only get one life. It’s certainly a way to test to see if the full $3 version is right for you. Gamers of a certain age will enjoy Vector Tanks’ old-school look and feel, while younger games should appreciate the challenge of a game that rewards racking up high scores with finite resources. Download Vector Tanks and commence firing ASAP. Vector Tanks is compatible with any iPhone or iPod touch running the iPhone 2.1 software update.